Trip Summary: Everyone has moved on to their next destination whether that be home, southern Patagonia, the plains of Salta, or back to work. During the last few days in Mendoza everyone has been enjoying all that Mendoza has to offer - comfortable beds and rest, good wine and food, and the warm weather. We had a busy last few days on the mountain. As we waited at our high camp at Berlin in the high winds and cold for the anticipated weather window and summit day a couple of members were feeling the altitude and decided not to attempt the summit. Smart decisions considering how strenuous summit day is. Others were anxiously waiting for their long awaited opportunity to give it a try. We had come a long way in a short time. On summit day we went up in two groups according to the anticipated pace of the members. Summit day was a long tough day - but we managed to have the first person on top that day. It was sunny and calm on the summit on Valentines Day and we enjoyed about an hour up there as a line of people behind us made their way up the snowy slope, known as the "Canaletta". 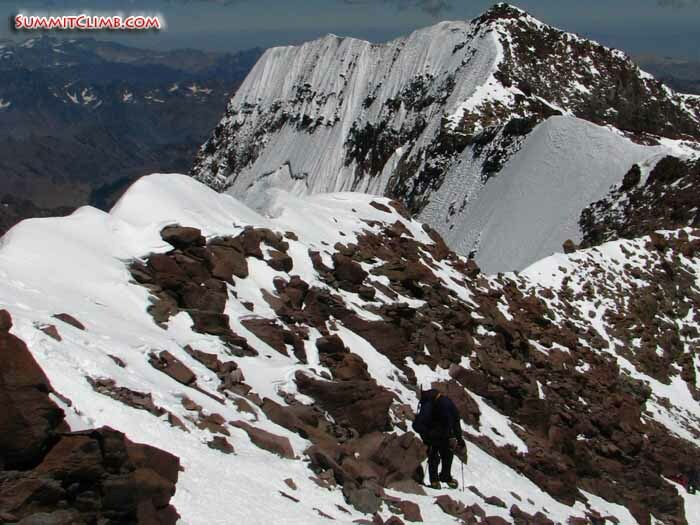 Shortly after summiting, Aconcagua started to generate some clouds and snow. According to local guides she has been generating her own weather which lasts 3 or 4 days in the last few years. Our timing turned out to be very good- we all met each other on the last section and summited within an hour of one another - we all soaked in some magnificent views as well as experiencing a great feeling of accomplishment washing over us before we started the descent. It was a long, slow descent for those who were really tired - some of our team had put in a 17 hour day. By about 8pm we were all back at Berlin, tired and satisfied- left only to hydrate before sleeping in our warm down bags. The next day - February 15th we descended to Camp 2 (Nido de Condores) and Camp 1 (Canada) and collected our gear - packs became quite heavy - as we made our way all the way back to basecamp at Plaza de Mulas. It is amazing that after many days and much hard work going up the mountain, the descent on Aconcagua can be counted in hours. On February 16th we hiked out to the trailhead at Horcones and slept in beds at our hotel in Penitentes. One member, who was suffering from sore feet and a sore body, opted to rest a day and basecamp and ride a mule out the following day with Ted which turned out to be a great experience. One which he recommends highly to future climbers! Thanks to Dennice and John, Stewart, Julie, Vitaly and Kevin for being such wonderful team members and thanks to Stewart and Dan for the great support. Aconcagua always promises a great experience, significant challenge, and many great stories and memories. She definitely did not disappoint us this year! Hi everyone, this is Doug Sandok calling in for the SummitClimb 2010 Aconcagua expedition on Valentine’s Day, February 14th. We had 6 out of 8 members summit today on Aconcagua under really nice weather. It wasn’t too windy and there were pretty clear skies up until 2:00 p.m.
With Doug Sandok, Stewart Edge and Vitaly Lazo summited at about 1:30 p.m. With Ted Alexander, John Soderberg and Kevin Murray summited at about 3:00 p.m. Everyone is back in Camp Berlin, our high camp 3. We’re safe and sound, tucked in and ready for a good night’s sleep. Team members in the top of the Canaleta, heading up towards the summit (Ted Alexander). Hi everyone, this is Doug Sandok calling in for the SummitClimb 2010 Aconcagua expedition from high camp. I’m inside a tent right now with Julie. We’ve had a windy, cloudy day as we moved up from camp 2, known as ‘Nido de Condores’, up to camp 3 today, which is named ‘Camp Berlin’. Everyone is doing well. It was a tiring day because we got up to 5900 metres/19,400 feet. There is a little refugio hut here that we’re using to cook and it’s quite nice inside. 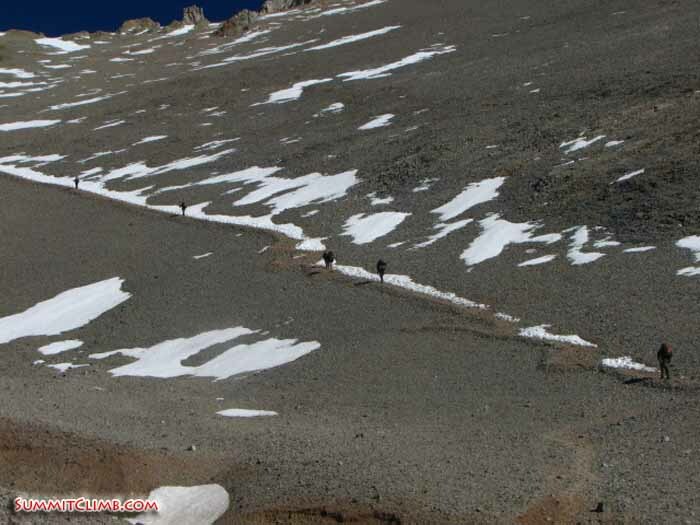 The final traverse between Campo Berlin (5950 metres/19,550 feet) and the Canaleta, which begins around 6600 meters/21,650 feet. It is an easy hike. Sometimes there is snow (Ted Alexander). Hi this is Ted Alexander calling in with an update for the SummitClimb Aconcagua team. 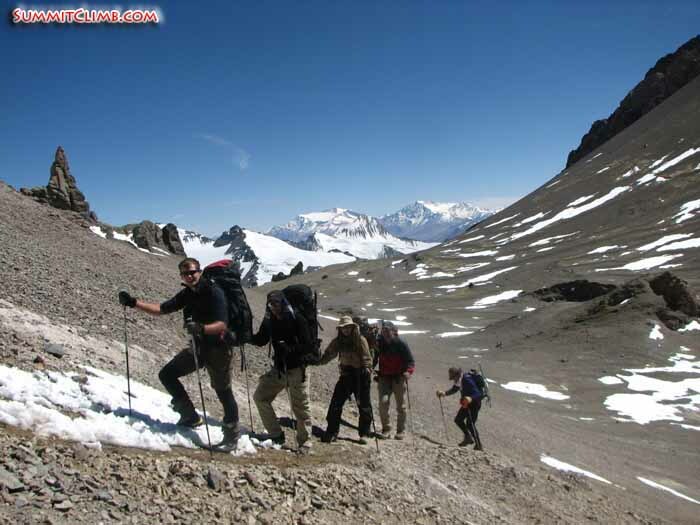 Team heading up from camp 1 (5,000 metres/16,400 feet) to camp 2 (Ted Alexander - 2008). Hi everybody. This is Doug Sandok, the leader of the SummitClimb 2010 Aconcagua expedition calling in for the 7th of February, 2010. We’re at Plaza de Mulas basecamp right now. We got up here yesterday and today we’re taking a rest day. We had some high winds last night, but today is generally sunny and beautiful. I guess there has been a lot of high winds around here. People are expecting the weather to get better around Monday or Tuesday. We are going to probably head up tomorrow and do a little carry to camp 1, called Camp Canada, then come back down here for the night and sleep. Everybody seems to be doing well. Yesterday was a long, hard day yesterday with some good elevation gain, but everyone seems to be acclimatizing well, staying healthy, eating some good food, and we’re having a great time with one another. Hi everybody. This is Doug Sandok, the leader of the SummitClimb 2010 Aconcagua expedition calling from Confluencia Camp. We reached Confluencia in the early afternoon today after a beautiful hike. There were great views of the astounding rock formations here. The hills are green in the valley, it’s beautiful and we can see some fine views of Aconcagua already, so we’re having a great time. Everybody is healthy. We’re at about 3400 metres/11,100 feet right now and everybody is just doing great. Kevin, Julie, Stewart, John, Vitaly and Dennice are all doing great.